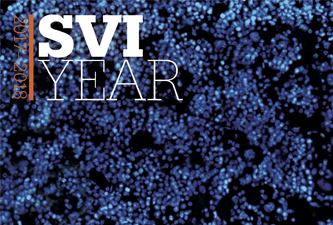 Our 17-18 Research Report 'Rising stars - the next 60 years at SVI', features many of SVI's world-leading researchers and students, including Dr Michelle So, Dr John Scott, Dr Jacki Heraud-Farlow, Dr Ramin Shayan, Associate Professor Natalie Sims and Jasmina Markulic. The Directors' Report reviews how far we've come and where the promise of our rising stars might lead us, and discusses the 'changing of the guard' on our respective Institute and Foundation Boards, which keeps us heading in the right direction. The Report also features stories of people who have shared their disease journeys with us, and reminds us all of the importance of medical research. We thank David, Karla, Di, Sheryl, Jane and Wanda for their honest accounts of their experiences. As Melbourne's third oldest medical research institute, and one of the few that diversifies its research focus to a range of common diseases, such as Alzheimer's, cancer, diabetes, diseases of cancer survivorship and osteoporosis, there's sure to be a story that you can relate to. A new feature of this years' Report are the infographics pages, which provide up-to-date disease statistics, as well as our research activities in these areas. As you will see in our staff listing, it takes many people to make great research happen. It also takes our many fundraisers and supporters, many of whom you will see in our two-page photo spread at the back of the publication. We couldn't fit them all in, but we hope they know how much their dedication and support for SVI means to our researchers, and to the people who benefit from their research. For more on that, refer to the Foundation Board Chair and CEO Report, and refer to our list of supporters. The story of the SVI Discovery Fund is also sure to impress and inspire you. And last but not least, you'll note when you see our Financial Report that we run an efficient ship at SVI. This is to ensure that the every possible dollar ends up on the lab bench - for our researchers, their equipment and the supplies they need to get them that one step closer to making discoveries that can better treat or prevent the diseases that unfortunately, too many of us know too well. We hope you enjoy reading our Annual Report; you can view it here.